For Mixx users out there, a new feature has been added. 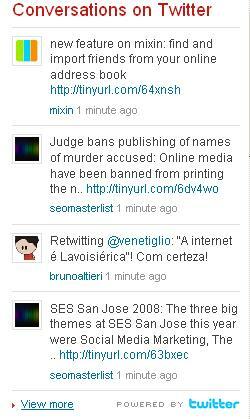 Twitter feeds are now available through Mixx Communities. If you run a Mixx community, you'll find the ability to import a Twitter feed in the Editorial section of your group management page. If you are not a Mixx member, check it out. It's a good way to stay informed about what's happening in any given topic, and a fantastic time killer. Read about the ins and outs of Mixx and check out the Groups and Communities, where you can find just about anything, or create your own. Below is a partial screen shot of the Twitter feed with Mixx from the Website Professionals Community.